The Flames have been playing increasingly better as the season has continued, but still find themselves 4 points out of the eighth and final playoff spot in the Western conference. The team’s play has gotten better because of 2 reasons: 1. The team finally starting to grasp Bob Hartley’s style of play and system and 2. Jarome Iginla’s improved play as of late. The captain has posted six goals (eight points) in his last seven games. Miikka Kiprusoff had finally rejoined the Flames lineup and will put an end to Calgary’s sub-par performances in net. The Flames pulled off a surprising win against the Northwest Division leaders Vancouver Canucks. The story of this game was how Danny Taylor outplayed seasoned veteran Roberto Luongo to lead the Flames to a 4-2 win. The Flames played consistently well through out the game and that was their key to the victory. After the win against Vancouver, the Flames took on a just as equally talented team in the San Jose Sharks. However, to everyone’s surprise again the Flames notched the win in good fashion being that the final score ended 4-1. The Flames enjoyed a change in the goalie department as Kiprusoff made his return to his crease. He played well in his first game back stopping 32 shots. ANAHEIM, CA – MARCH 08: Ryan Getzlaf #15 of the Anaheim Ducks shoots the puck past goaltender Miikka Kiprusoff #34 of the Calgary Flames, as T.J. Brodie #7 and Mark Giordano #5 of the Flames defend in the third period at Honda Center on March 8, 2013 in Anaheim, California. The Ducks defeated the Flames 4-0. The Flames were hoping to keep this streak going taking on the Anaheim Ducks but this would not be the case. 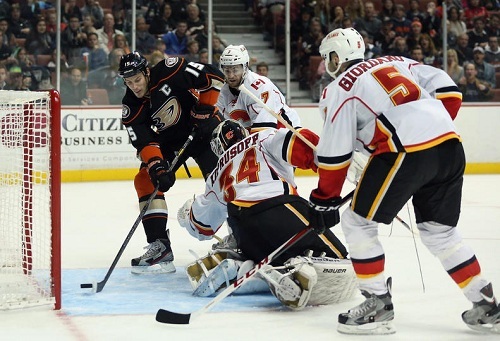 The Ducks stumped the Flames 4-0. This was a frustrating night for the team as they felt they were getting chances, but they were just not going their way. The Flames take on the Los Angeles Kings tonight at Staples Center at 10:00pmET.